These is why everyone chooses The Prestige Maids as preferred cleaning service provider: you owe it to yourself. The Prestige Maids has always exceeded my expectations. They're always going above & beyond to make sure all my needs are met. They have a very professional & friendly staff. The Prestige Maids are extremely thorough and pay attention to small details. No job is too big or too small for them. Every time they clean, I am impressed with their attention to detail. It is so nice to come home to a house that is truly clean. I have been so impressed that I have recommended Prestige Maids to all of my friends. The Prestige Maids team is just wonderful. They are always prompt. They do an excellent job and truly care about their clients. I have always used cleaning services in the past but I feel they are the best! Your service is always Excellent. From the first day you have been professional and attentive. I would and have highly recommended you to friends and business partners. Each and every time, I am impressed with the results. I am very satisfied with the services provided by The Prestige Maids Professional Cleaning Services. They have been very responsible in keeping their appointments and cleaning the house thoroughly. I recommend them to any interested new customers. Their cleaning system is excellent. From the moment of arrival until the time they leave.They know just what to do. Always with a smile! Bring all necessary tools and supplies. Very warm and friendly. The cleaning was excellent, I'm always pleased with Prestige Maids, I love coming home to a clean house. You guys did an outstanding job. I have no complaints what so ever. Awesome Cleaning Service! We so appreciate your service, and I hope you will pass along our thanks to the team that cleans our house. The shower looks great, thanks! You allow us to have much more family time now, and actually enjoy our weekends more. Thanks again! I have to admit, your customer service and quick response is the best so far. The best of all cleaning companies in Georgia. We were impress with the quality of work they did. 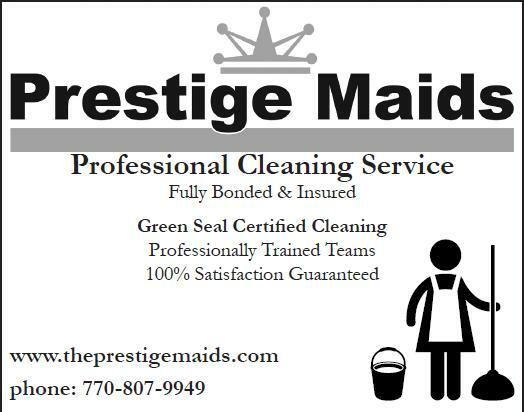 The Prestige Maids are a wonderful asset to have in maintaining the cleanliness and organization of your home! I have been a loyal customer for 1.5 years and couldn't be happier. I was initially nervous in selecting a cleaning team for my home, but they immediately put my uneasiness to rest from their first visit. My home is spotless after each cleaning and smells divine. I have even increased the frequency of their cleanings! In addition to a superb cleaning job, they also keep my house organized. My home is handled with complete care...they care about my family and my home! If you seek a professional, courteous, expeditious and honest cleaning team for your home who cares about you and your family's needs, The Prestige Maids are the company for you! We used The Prestige Maids twice a month for about six months and they have done a wonderful job. They are hard workers and the house looks beautiful and clean when they leave. I found Prestige Maids through a friend who recommended them. I have used their services for about 3 months, on a bi-weekly basis. After this period of time, I can confidently say that the service, and the customer service, are exceptional. They do a great job. I would definitely recommend this company. Thank you so much for the professional cleaning my home received. The girls were pleasant and nice and quick. Your invoice was exactly as the estimated. Communication was kind and immediate. I highly recommend you!